To celebrate the Multi-Award nominated ‘New Kind of Musical’ – STREETS, and to continue fundraising for its return in January 2015, Interval Productions presents STREETS PARTY | London’s Got Talent. A night of live entertainment; featuring stars of The Voice and The X Factor alongside some of London’s hottest and freshest talent, as well as an exclusive preview from the cast of STREETS. 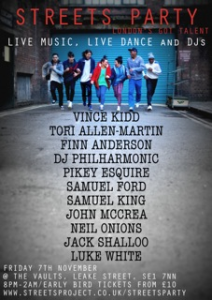 Vince Kidd, finalist on Series 1 of The Voice, and Luke White, formerly of Times Red (X Factor wildcards) will both be performing sets, as well as STREETS writer and producer Tori Allen-Martin who appears on Idris Elba’s forthcoming album Mandela. Live music commences from 8pm, with DJs taking to the decks later on in the evening so that you can dance the night away, after being suitably inspired by some of the most dynamic dance acts in the UK. There might even be a bit of face-painting action. Come and hang out with us in one of London’s most exciting venues for an underground street party. Escape, and get lost for a few hours; forget your worries and just immerse yourself. FEATURING: Vince Kidd (The Voice), Finn Anderson (Alba, Streets), Tori Allen-Martin, Pikey Esquire (beatboxer), Samuel Ford, Samuel King (spoken word artist), John McCrea, Neil Onions, Jack Shalloo (Departure Lounge, Charlie and the Chocolate Factory), Luke White (X Factor), The Cast of ‘Streets’, DJ Philharmonic and more TBA.